A couple weeks ago, we saw some leaked User Agent Profiles (UAProfs) for a trio of Samsung tablets. At the time, the data we had made us think that the UAProfs were showing the next generation of the Galaxy Tab 10.1 series devices; but, new evidence is showing that they may be a new set of devices with 12.2-inch displays. 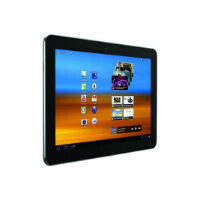 We had seen UAProfs for Samsung tablets with model numbers: SM-P900, SM-P901, and SM-P905. The "P" in the model numbers tends to indicate that there won't be S-Pen support, and the devices were listed as having display resolutions of 2560x1600, which would seem to indicate something in the Galaxy Tab line, but it seems we may have been off on the screen size. We assumed 10.1, because that's all we've seen so far with a resolution that high, but an import/export database from India has the SM-P905 listed as having a 12.2-inch display. A 12.2-inch display with a resolution of 2560x1600 would mean a pixel density of 247ppi, which is still pretty solid. And, it would fall in line with the lower price points that Samsung goes for with the Tab series devices. How about changing the design and build quality for this tablet Sammy? That would be a miracle. When Android sites like Android Police say your tablet build quality makes them "want to vomit," you may have a problem. I think Sammy will listen to its consumers. And I hope with the design phase 3.0 they would improve the build quality of its devices. Hence Note 3 would be launched with premium material. Huh? Samsung's designs and build quality far exceeds other phones. If other phones have better designs and build quality, people will be buying them instead of samsung. However, nobody buys Nokia, Sony, Htc, lg and such. People and market have spoken loud and clear. No, Samsung's material quality is one of the worst, probably only better than Chinese whitebox and counterfeit products but inferior to Sony, HTC, Nokia, all of them. HTC one can be had for $50-100 with contract, Nokia 920 for free or $50 w/contract. (and Sony is a non-player in US) But still nobody buys them. S4 can be had for $150-200 with contract, and millions are sold. What were you saying about material quality? Because of brand bias. The same applies everywhere. When everyone use that brand, and word spreads around, the general assumption is that it is a very good product, and people goes back to the same brand for an upgrade because they never tried other alternatives. Trying something different without any knowledge is commonly associated with risks- something most people avoid. This scenario applies for those with less knowledge about smartphones, which is the majority of smartphone users. If that is true, HTC should be #1 android phone maker, and Nokia should be #1 smartphone maker(symbian). I get so tired of all of these idiots whining about the design.....yes its not as good as some but its decent and durable....If you hate of that much don't buy it but don't come on here and mindlessly whine about it! The design will all change with design phase 3.0 and will be brilliant so stop complaining! Them whining makes them think they are knowledgeable which they are not.